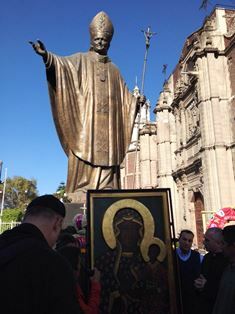 The arrival of Our Lady of Czestochowa the "Black Madonna" and the Mother of St. John Paul II in Latin America means that millions of families will come to venerate Mary, Mother of God and all men. She brings to Mexico the message of mercy, courage and commitment to build the civilization of love and life. With prayers of petitions and gratitude, the Mother of God, Mediatrix of all graces, joins us in this historic moment. We know that she intercedes for us to her Son, the Lord of Life, and offers ways for humanity to turn their eyes and hearts to the respect of human dignity within families, between spouses, in our communities, schools, workplaces, businesses, in public place as well as in social and political life. This respect for human dignity is the foundation to of just society. A society where we can live in peace. "It is clear that the pilgrimage of the Mother of John Paul II will awake in Latin America and the Caribbean Region the awareness that every person, every community have to raise their voices to announce the dignity of every person. Every couple who live the grace of conjugal love, and therefore of the family is an oasis of love in the XXI century. Recall that Jesus spent 30 years in the Holly Family. What does Jesus want to teach us?" Said father Jaroslaw Szymczak, a member of the International Committee and President of the Family Support Foundation, which has been working successfully in Latin America under the auspices of Vida Florida Foundation. "She wants to remind us that to be born, grow, live, work and die in a family is central to the development of the human person", he added. Vida Florida Foundation will be the coordinator of the pilgrimage in Mexico. This is a pro-family foundation sponsoring initiatives to restore human dignity, marriage, and family life. Families, couples, children and infirm are welcome to pray before the sacred icon and ask Our Lady for intercession. Contributions of all kinds and voluntary donations are welcome, as they are needed to support the realization of the pilgrimage. The global pilgrimage of Our Lady of Czestochowa From Ocean to Ocean in Defense of Life started in 2012 at the port of Vladivostok in Russia. Has toured Asia, Europe, North America, and from this moment we are preparing her journey through Latin America. Mexico has becomes the entry point of this pilgrimage to the southern hemisphere of the Americas.